Have been getting alot of questions from folks here in the campground as to where I purchased my door mat that fits perfectly on the step in the motorhome. I purchased the mat that is pictured here http://www.amazon.com/Apache-Mills-0431902E-Indoor-Outdoor/dp/B001HUPA7K/ref=pd_sim_sbs_k_19 at Walmart. It cuts perfectly to fit on the step surface inside the motorhome both before and after the screen door. It is non slip and captures the dirt off shoes prior to walking around in the PC. Walmart had it in several colors. I've used it in the 2008 PC as well and it still looks like new. We found a bunch at the Dollar Tree. I bought 4 of them and went back to get more and they were all out. I will keep looking each time I go in to our local Dollar Tree and just may hit upon them again. For a buck a piece, you can't go wrong. 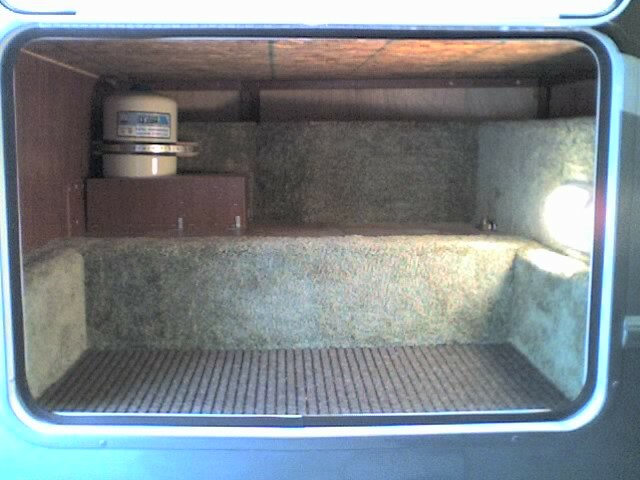 We had an older one, good condition and big enough that I fit to the back area of our CR-V. Will look for for the steps. We bought similar material by the foot off a roll at a home improvement store. I cut it to size for the main entry door step and also in the outdoor storage compartment. In this picture, it is the brown mat in the foreground. It protects the fiberglass surface and eliminates rattling noises too. I had a chance to take a couple of pictures of our door mat for the steps. Work great in keeping dirt out of the PC. Sharon wanted “welcome” on the screen, I wanted “go away” we settled on the circles. Then we saw this at Lowes. Billy, I cannot show my wife your floor mat or I will be spending more money. I told my wife when i die I'm taking my money with me. She said if you go first I'll write a check for yours. Billy, what are those called? I looked on the Lowe's website - "screen decals". Lowe's had no clue... My wife can't seem to figure out when the screen door is open and when it's closed. Crying over spilled wine. So I take it, the horizontal stripes in the screen door isn't meeting the visual aid required for some of us. Maybe the factory could send the screen doors out to a local shop to have the full body paint pattern flowing through the screen door. But then we would not be able to find the door. screen decals they are not. It doesn't look like it but a lot of work was in them. We purchased them at wally world. Thy are stencils, placed on the screen, masked off and painted with Fusion (plastic) paint. One by one. Also masked off the back so the paint would not bleed thru.